The “Umbrella Plant, is an absolutely superb specimen that starts off with truly gorgeous sprays of pink flowers on thick stems in earliest spring. It then pushes up umbrella-like leaves, rather like a gunnera but not as large or sprawling. This stunning waterside plant is especially wonderful in the waters edge, or where it can be allowed to grow large, although it does perfectly well in a dry garden!. Water lily we think it is Rose Nymphe. Large leaves Vigorous habit white flowers with a hint of pink. Cornus alba sibirica ‘Red Twig’ will grow in any soil, but for best winter stem colour a moist site in full sun is recommended. Sibirica is a deciduous, upright growing shrub with brilliant smooth, crimson red stems, dark green leaves, small clusters of white flowers in early summer and small white berries.. This dogwood looks stunning planted in groups, beside water or in a winter border – and works well with orange or yellow –stemmed varieties of other dogwood. Hard annual pruning produces the best display of colourful winter stems, prune second year within 2 in of the ground on previous years growth. Tolerates full sun to partial shade. Choisyya Ternata Mexican Orange Blossom. Wonderfully scented, star-shaped, white flowers appear in late spring among glossy, aromatic, dark green leaves. This handsome, compact and easy-to-grow shrub is a valuable garden mainstay for a protected site in sun or part shade, although in shade it may not flower. The glossy, evergreen leaves provide an excellent backdrop for medium-sized perennials and pale-grey or purple foliage plants. Hemerocallis produce elegant, usually trumpet-like blooms in summer and are easy to grow in many gardens. 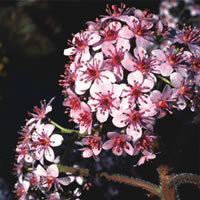 Each plant produces many flowers, so displays will last for weeks. I am thinning out areas of the garden and I have potted up specimens of these and many others too.